From the china clay industry's photo archive maintained by the China Clay History Society at the Wheal Martyn Museum, St.Austell. It is a "blow-up" from a view of three end-tips having discharged their china clay loads on an end tippler at one of GWR's Carne Point jetties for loading to ship. The view had no date and Colin suspects it to be between 1913 and 1930. Colin asks if anyone can enlighten us further especially on whether it was a one-off or in a batch. In 1906 and 1916, the GWR bought in secondhand end-tips through wagon dealers to address shortages of clay-tips. Bob Essery makes the point that the wagon could have been sold (by the LNWR or LMSR) and found its way through wagon dealers to the clay companies or agents like Toyne Carter who owned the two wagons attached to it. Whilst on this subject, my group members have enquired as to the extent that both in pre-grouping and pre-nationalisation days, were LNWR, MR and LMS wagons used for the transit of bulk clay from Cornwall/Devon to the Potteries and Scotland (as opposed to GWR and SR ones)? I am only able to comment partially, but surely the wagon is not an "end-tip" but an ordinary open goods wagon to Diagram 4? In pre-grouping days goods could only be consigned in wagons of the originating company. 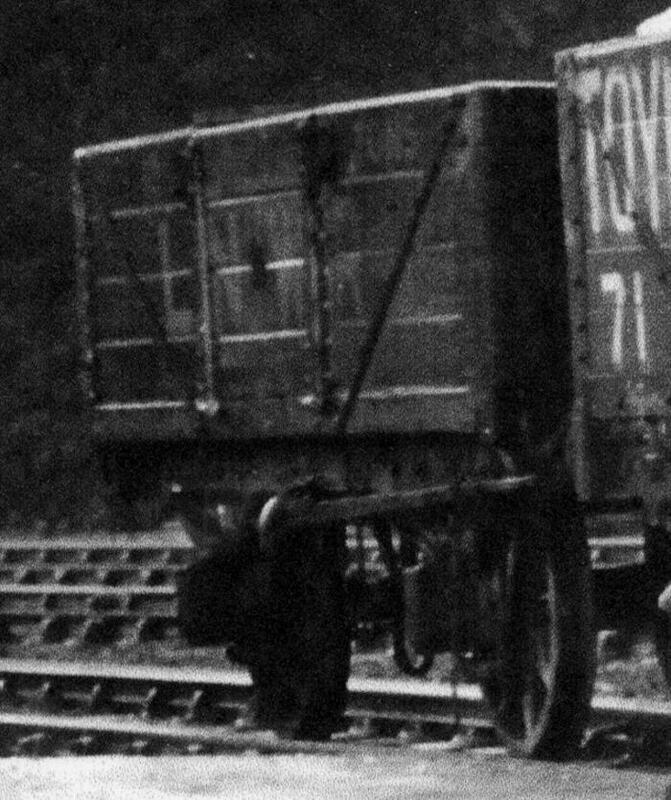 Inward loaded wagons had to be returned empty to their owning company, and could not be "back-loaded". Once pooling began during/after WWI then (ordinary common-user) wagons belonging to any company might be used. I have to say that I have never heard of either the LNWR or the LMS selling life-expired wagons to dealers for further use. If such a thing happened the wagons in question would have been for internal use only and not allowed out on the main line. It was of course not unknown for railway wagons to be "liberated" especially by collieries and ports. Even into BR days each year a few disappeared without trace and were written off. Well spotted Philip - I hadn't fully read the caption! In the early days very old chaldron wagons were sold out of service when they were life expired, but this wagon looks to be in general service. In the modern era (post 1900) I can't think of any ordinary wagons (as distinct from Warflats etc) sold by the LNWR, but remember the preserved D9 4-plank open wagon on the Nene Valley Railway which their management are adamant came from a local company - I think a flour mill. It is clearly an LNWR wagon which has been repaired later in life but the flour mill must have got hold of it somehow, so maybe they bought it from the LMS? Even here though it was probably for internal use only. But as Philip says, it seems much more likely that this is still in LNWR service and has delivered a load to the area.